Ford manufactured the Bronco between 1966 and 1996. This compact SUV is still popular with off-road fans. We offer a wide variety of OEM Ford Bronco parts that will help you make the repairs that you need in order to get years of use from your Bronco. Call us today at 585-475-1064 and speak with our experienced staff members who will help you find even the hardest to find parts. Shift Knobs – A shift knob may never wear out, but if you're looking to make an interior change that will add a sportier look to your vehicle, change out the shift knob. We carry these and other interior accessories like consoles and floor mats. Interior Accessories – The interior accessories help to enhance the value of your vehicle. Add a new set of floor mats to help preserve the carpet or replace a worn out door handle. We have these parts and more. FordPartsOnSale.com stocks parts for Ford vehicles dating back to the 1980s. 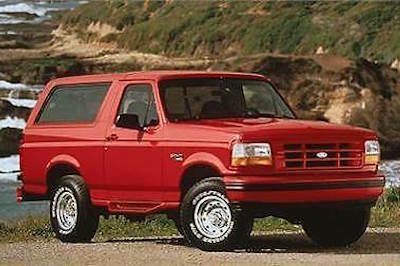 We can provide the OEM Ford Bronco parts to repair your vehicle and keep you on the road. We never deal with low-quality imitation parts and source our parts from the factory. Shop now.